Considering Microsoft Teams and not sure which device is right for you? Not ready for the cloud and want to protect your IP phone investment in Skype for Business? Want simple single-click switchover between Microsoft environments? OK, we've got that covered! The AudioCodes IP Phone Investment Protection Plan removes all the risks and uncertainty, allowing enterprises to invest in IP phones with confidence. BUY any AudioCodes 400HD IP phone today (all models are Microsoft Teams and Skype for Business compatible). UPGRADE to any AudioCodes native Teams Phone (such as the C450HD) within two years and receive a full credit on your original IP phone purchase. The AudioCodes Native Microsoft Teams C450HD IP phone supports both native Microsoft Teams and Skype for Business! 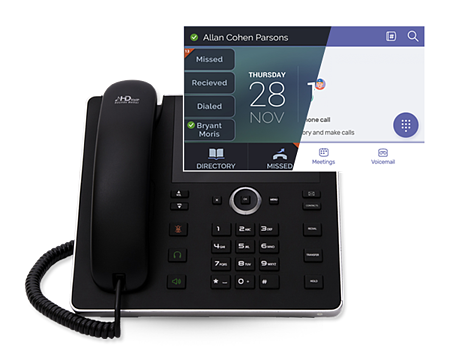 The AudioCodes C450HD IP phone is equipped with a 5” color touch screen (1280x720), and can switch between Microsoft Teams with a native Teams client experience and Skype for Business with a single click. In addition, the entire AudioCodes 400HD series of IP phones work with both Microsoft Teams and Skype for Business, allowing organizations to gradually migrate to Microsoft Teams whenever they wish. Indicate quote #1034672 to take advantage of this oﬀer. AudioCodes may change or terminate this plan at any time and without notice. Contact AudioCodes for complete terms and conditions. For additional information, fill in this form and contact us.